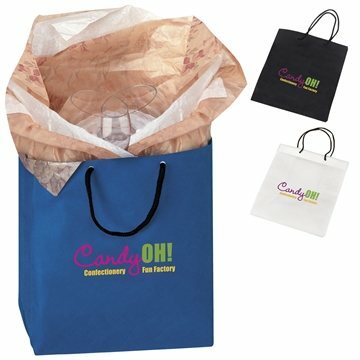 Made of non-woven polypropylene, this bag is a durable alternative to gift wrap. Great for gifts, corporate events, weddings and more. this bag is perfect for party favors. We used it for a company event and the guests loved the idea. I provided a logo I need, to be clear the logo turned out perfect! It is quite professional looking. this put us on the map! Literally! Great idea guys! Much better than I was expecting for a great cost. Thanks. Great bag for your cost.